The publication manager is Rémi Peschier, president of the FRHPA Rhône-Alpes. SARL Ctoutvert with a capital of 56,312.05 Euros, located in Toulouse (F-31200) and registered in Toulouse Trade and Company Register with the number 433 265 618 under the Siret reference 433 265 618 00020 APE/NAF : 722Z. The company Azure provides direct and continuous storage for the website. This service can be accessed freely by any User having an Internet connection. All the costs related to accessing the Service, be they material costs, softwares and Internet connection costs, are upon the User. The User is the only one responsible for keeping their computing devices in good working order. The Fédération de l'Hôtellerie de Plein Air Rhône-Alpes is making use of all reasonable means available to provide a quality access to their website. Yet, they do not guarantee it. 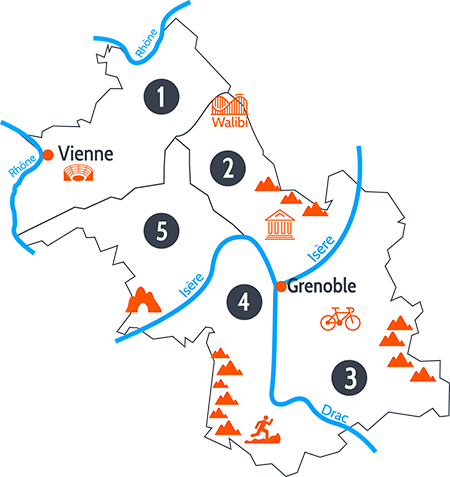 The Fédération de l'Hôtellerie de Plein Air Rhône-Alpes cannot be held responsible for any dysfunction of the network, the servers and any other event that may prevent and damage access to the Service. The website www.campingisere.com and its content are protected by French Copyright law in force. The Fédération de l'Hôtellerie de Plein Air Rhône-Alpes is the exclusive owner of all copyrights of the website and its contents. Each establishment member of the Federation and www.campingisere.com is liable for the personal information sent by the User visiting its web pages. The User can use their right: when contacting directly the campsite from www.campingisere.com. The information available on www.campingisere.com comes from reliable sources. Yet, The Fédération de l'Hôtellerie de Plein Air Rhône-Alpes cannot guarantee nor the reliability neither the accuracy of information. Besides, the information available on the website is for information only and shall in no way be considered as recommendation of any kind. Consequently, The Fédération de l'Hôtellerie de Plein Air Rhône-Alpes shall never be held responsible for the information and contents available on the website on no account. The User is responsible for his using the website and the information with their own proper judgment. The User agrees to respect the rules and laws in force in France in general. The website www.campingisere.com contains hyperlinks towards websites operated and edited by third parties. Since there is no control on external information, the User acknowledges The Fédération de l'Hôtellerie de Plein Air Rhône-Alpes is not liable for the information and content available on third parties websites. The Fédération de l'Hôtellerie de Plein Air Rhône-Alpes shall never be held responsible in the event of absolute necessity and events out of their control. The present agreement runs over an unlimited period of time from the moment the User browses the website.